I have developed a heavily-modified version of HYSPLIT which works with a wide range of climate models, and can be used to rapidly estimate source contributions for precipitation, dust, or other transported species. It can be used to classify the climatological influences relevant to a given paleoclimate record. Using paleoclimate simulations from a global climate model, it can estimate how sources for a given record have changed over time. We have compared this method with coarser – but more accurate – water vapor tracers embedded in the Community Atmosphere Model, finding a high level of consistency between the two. We used this tool to explain how changes in sea ice cover during the last glacial could affect accumulation in a seasonally-rectified way (Rhines and Huybers 2014). 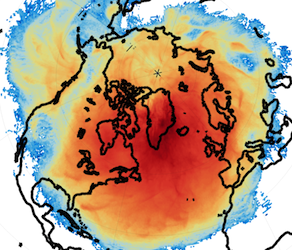 Boundary layer residence time footprint of air parcels that arrive above central Greenland within a week. We have used the diagnosed seasonal rectification to produce a complete budget of source temperature, sink temperature, and seasonality effects which influence the stable water isotope paleothermometer calibration for the Greenland ice cores. Source and seasonality biases cause the traditional calibration to substantially underestimate temperature changes in Greenland, a process which we are able to diagnose directly from the source model.